Ralph Jackson was born and raised in a small village near Durham. Born in 1924, he left school at 14 and worked as a Grocer's delivery boy in the years before the war. 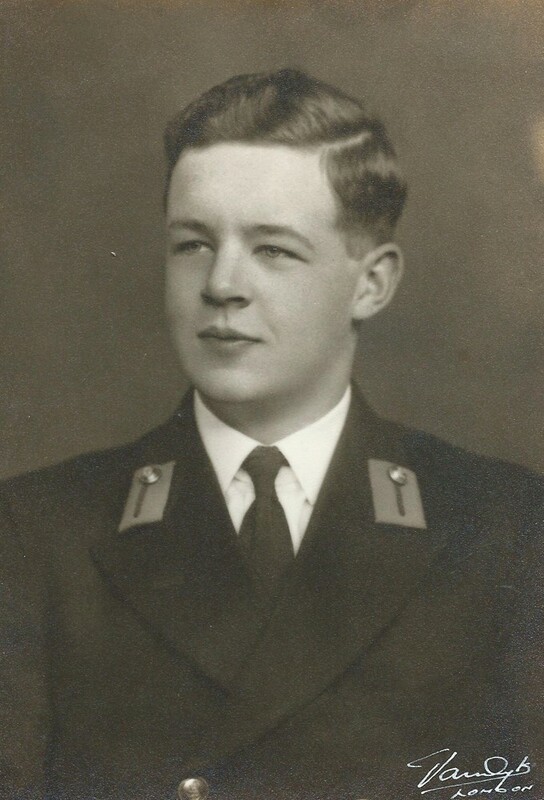 At the age of 18 Ralph was called up and passed his army medical A1. 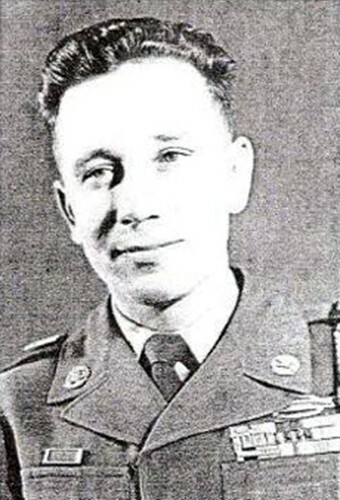 He formally enlisted for five years service in November 1942 and was sent to Dale Camp in Chester where he underwent 6 months basic infantry training. 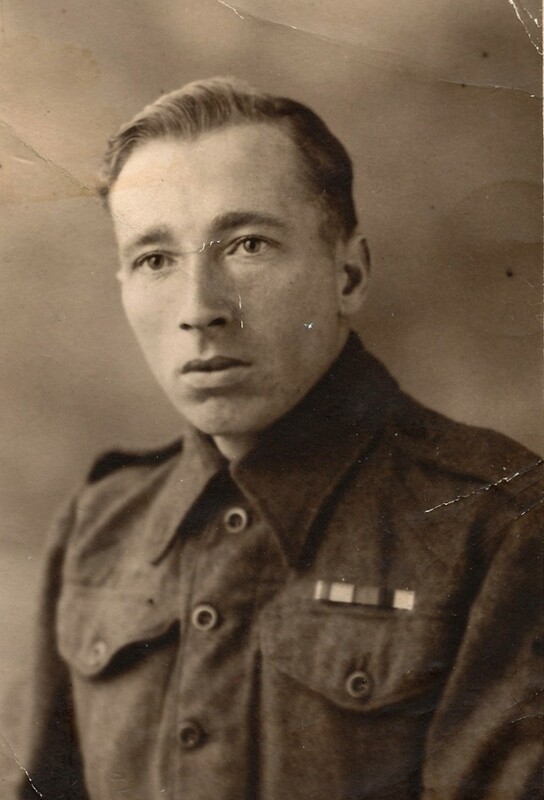 At the end of that year Ralph was posted to the 7th Battalion of the Royal Northumberland Fusiliers and moved to Shorncliffe Camp in Folkestone. Through 1943 there was more training as Classified Scale D Class 1 Driver and particularly as Vickers Heavy Machine Gunner. Training continued throughout the year and went on to include driver mechanics’ and water duties course’. 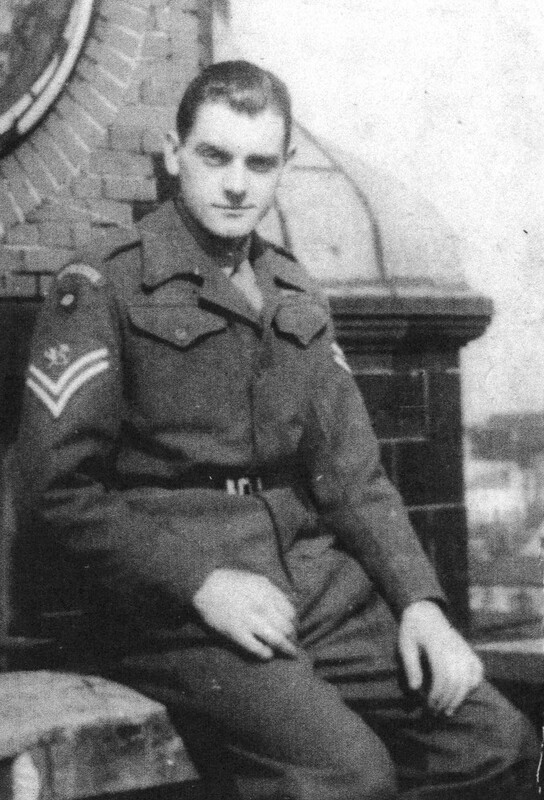 On 11th May 1944 Ralph was given his first home leave. As soon as he returned to base, the Battalion was transferred to Tilbury in preparation for embarkation. The Bren Carrier was a tracked vehicle of about 4 tons. We had a crew of three, with me as the driver. There was a Vickers Heavy Machine gun built in at the front, and a Bren gun mounted on the open rail. Driving wasn’t easy as there was only a small viewing opening at the front. Although we were supposed to set off immediately, there was bad weather in the Channel and we just waited off the Kent coast for about 6 days. I really have no idea how many men were aboard, but I’m quite sure everyone was just about as sick as I was. There were virtually no facilities on board as we were supposed to go straight to Normandy overnight. As Ralph had suspected, he was first off. The Bren Carrier was transferred onto an LCT (Landing Craft Tanks). Fortunately by that time, the landing was unopposed. Armoured vehicles of all types along with supporting troops landed without much incident. By this time the Battalion was attached to the 59th Staffordshire Division which formed the break-out force tasked to take Caen. “I always think that it was the delayed crossing which saved my life. By the time we landed the fighting had moved inland. Nevertheless the landing was quite tricky. Our Bren Carrier was fitted with skirting panels which were designed to stop us being swamped by the water. These could be simply removed with a spanner, but on ours the front panel became twisted and it obscured my view. Anyway I just put my foot down and we were on the beach. I hardly got my tracks wet! We landed in the late afternoon at about 5 o’clock and quickly cleared the beach to move inland in the direction of Caen. We found a wooded area and camped there for the night. Before long our first action brought us to the harshest realities of war and yes, we lost some good pals. It was a 450 bomber raid, dropping in excess of 2,500 tons of high explosives. The action was carried out by Halifax & Lancaster heavy bombers which crossed the city in waves, starting at about 22:30 on 7th July. The bombing was only about 1,000 yards ahead of the British lines so there was much concern about accurate bomb aiming and keeping ahead of Allied troops. The German forces had retreated under this onslaught but fierce fighting continued as the Battle of Normandy slowly progressed south towards Paris and east to he Rhine. “One evening we pulled in by a farm house. We put the netting up over the Carrier and set up the radio mast to get an update and receive orders. One side of the Carrier sank into the ground and the tracks became lodged for a while. Once I drove out we uncovered a food store. The locals had a habit of secreting food in such places and we pulled out a whole ham along with lots of other food. We had a real feast that night! In fact, having the Bren Carrier provided us with a very useful mobile larder and we used the storage bins for all sorts of goodies as we progressed through the countryside. It was just as well since we were rarely in the right place to get our issue of rations. The town of Thury Harcourt was taken in the early hours of the morning of 14th August. Casualties were so severe that Montgomery took the decision to disband the 59th Division using the ranks to reinforce the 2nd Army which was by then well under strength. Ralph recalls the campaign came to an end with the enemy trapped in an area of sunken roads at Falaise. This became known as the Battle of Falaise Gap, or in French La Poche de Falaise’ where, after concentrated heavy shelling, the 59th Division joined with Polish, Free French and Canadian forces, the enemy was routed. Ralph explained the scene was just a mess of dead horses, troops and burned out armoured vehicles. “We were celebrated on that day and made to feel like conquering heroes. There were only 20 of us left from the 59th Division; I suppose this is a fair refection of the casualties we took during those days in August 1944. In June 2009 Ralph traveled to Normandy with D-Day Revisited for the 65th anniversary commemorations. With a cheeky look in his eye, he had gently suggested that we find a moment in the itinerary to visit the town of Thury-Harcourt, and so we did. Ralph was pleased to have the opportunity to lay a wreath in memory of the friends he lost in the battle to liberate this region 65 years earlier. As a result of Monty’s split up of the 59th Division, Ralph and his crew were transferred to No 33 RHU, awaiting a new unit for permanent assignment. At that time Ralph was still a Private but could see the advantage of volunteering so they could stay together as a team. Having transferred as Gun Carrier Drivers to a Machine Gun Platoon they were put on a slow train in cattle trucks. The plan was to catch up with their new battalion which was attached to the 15th Scottish Division in Helden, Holland. “It was just about the slowest train I’ve ever been on! Whenever we wanted to brew up one of us would jump off and run ahead to the engine and open the steam valve on the side. Each time I did this, I would then just wait until our carriage came along, then jump back on. There was also a time when we went passed an orchard. We all jumped off, filled our pockets and then just jumped back on again. We crossed the Rhine on my 21st birthday. In one of those amazing coincidences, we were waiting to cross on one of the buffaloes’ when the mail came in. It was 3 o’clock in the morning, and there in the mail was a birthday cake from my Mother! So we quickly shared this treat as we were boarding to cross the river. The retreating Germans broke the dykes to flood the Low Countries in a desperate effort to slow down the Allied advance. Eventually Ralph and his team continued right through to Lbeck on the Baltic Coast. That’s where they were on the surrender and celebrated VE Day in Lbeck. They stayed on in Germany and became part of the Army of Occupation. 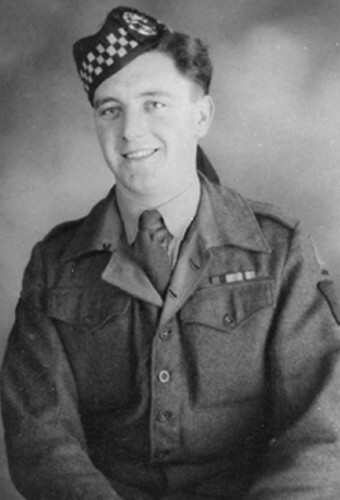 Ralph was promoted to the rank of Corporal in 1945 and later returned to Britain for demobilisation in 1947. 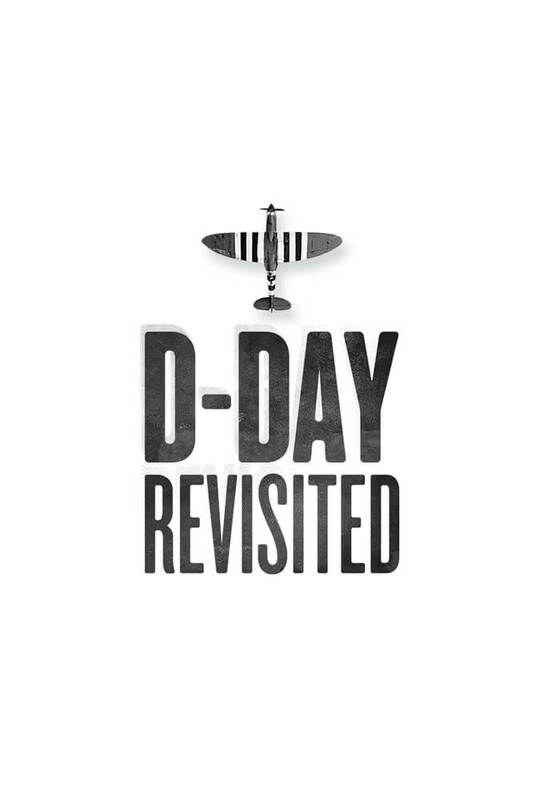 Like most Veterans, Ralph discusses his experiences of D-Day and the fighting which followed in a modest manner, without a hint of any bravado. It was simply something which had to be done at that time. 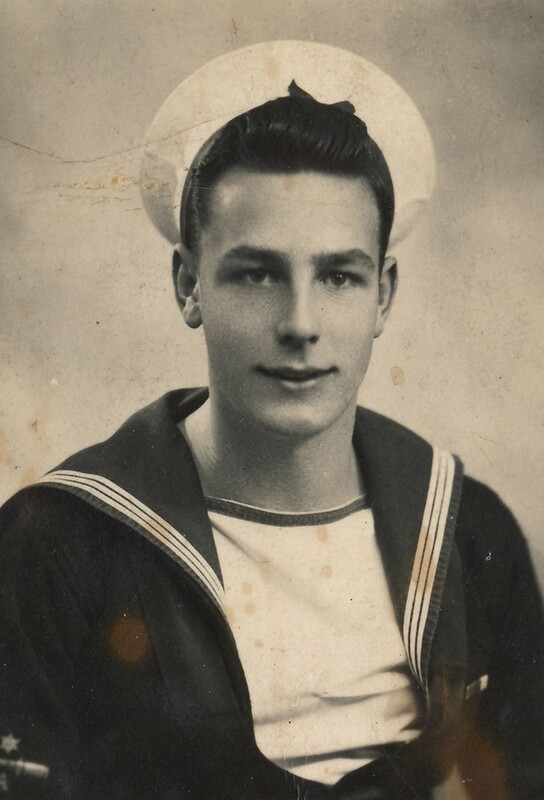 As much as the D-day Landings were about the Liberation of Europe, Ralph recalls the seven days they spent in the sea off Kent and jokes that D-Day was also about “getting off that bloody boat!”. “We were proud of what we achieved in helping to win the French people their country back. As I recall there were few casualties at the landings in the British Sector, although I know the Americans took a beating at Omaha Beach. 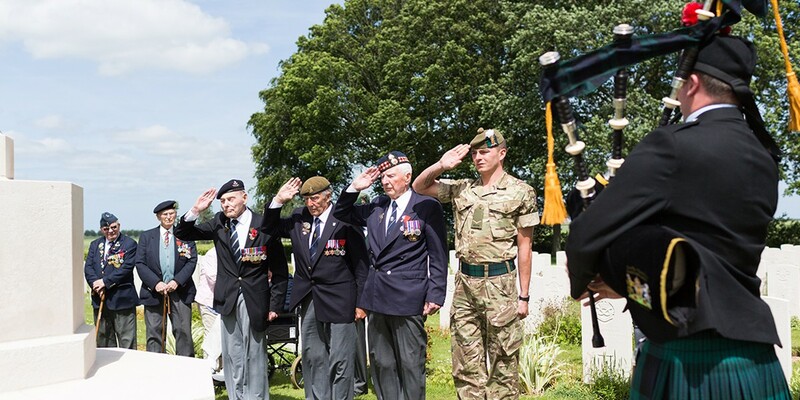 D-Day is well remembered and commemorated but for most of us, certainly for the 59th Division, but it was the fighting afterwards which was the tough part. Many fine men did not make it through like I did. 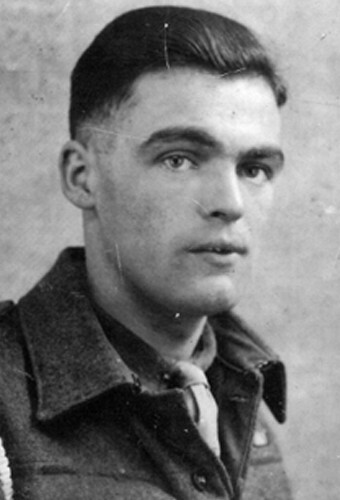 After the War, Ralph settled on the Wirral, not far from Dale Camp where he had been based for military training. By any measure the War changed Ralph’s life; he settled 200 miles from where he’d grown up, married and raised two sons, now with families of their own. On Ralph’s return to Thury-Harcourt in 2009, he was pleased to finally have the opportunity to show his wife, Doreen, the town he fought for all those years ago. He received a very warm welcome from the Mayor M. Paul Chandelier, who remembered him well from his previous visits. 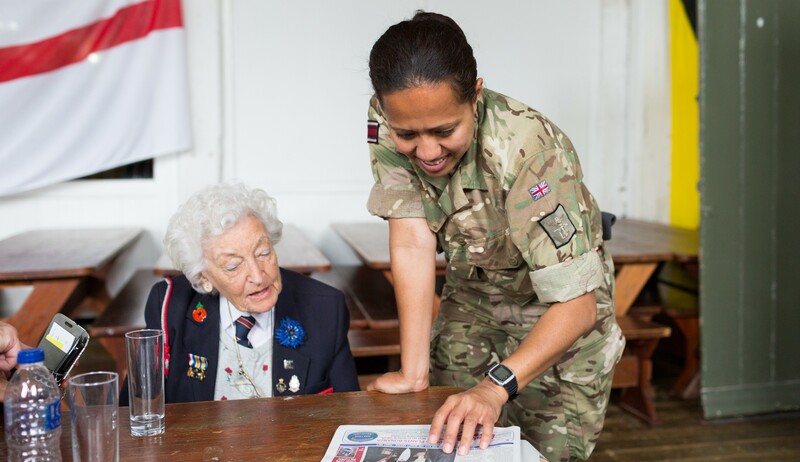 The entire D-Day Revisited group attended a reception at the Town Hall, where the local school children sang ‘God Save the Queen’ to honour the Veterans. It was a privilege to share this experience with Ralph, made even more poignant by the fact that that was to be his last visit to Normandy. Sadly Ralph died in June 2010. He was a good, kind man and our thoughts remain with his family. 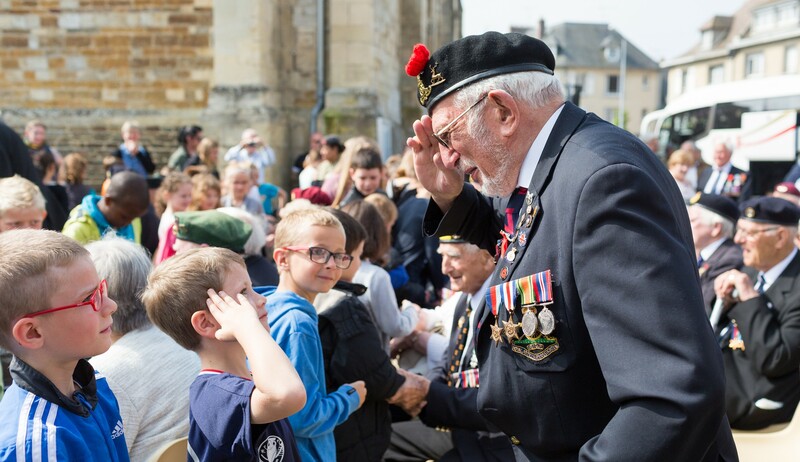 Since that first visit in 2009, the D-Day Revisited group has visited Thury-Harcourt each year and always been humbled by the kind reception the veterans receive from the townspeople. We will always be grateful to Ralph for introducing us to such a wonderful community.